This is my first year writing for the city guide and I couldn’t be more excited. Not only do I get to write about my favorite things, I get to sample all of those things. And it’s no secret I have a love for chocolate. These chocolate folks are relative new comers to the Austin food scene and I have chosen my three favorites. We have a bean to bar maker, a retail store, and a wholesaler that is all throughout Austin specialty shops. 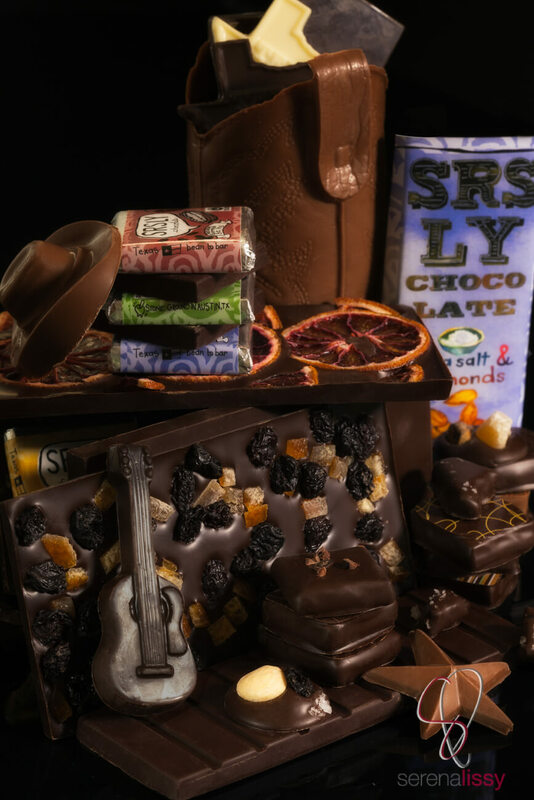 As you can see from the images, there are quite a variety of chocolates that are produced by these three companies. I’ll start with Srsly Chocolate. They are a bean to bar company. But first, a little background on what bean to bar is. Bob Williamson and his wife Robin Simoneaux-Williamson spend their time roasting fermented cacao beans they receive from the Conacado Cooperative in the Dominican Republic to bring out the chocolate flavor of the beans. Once roasted, they crack the beans to remove the cacao nibs from their husks. The nibs are roughly ground, where over time, they transform into a paste, before getting scooped into a granite stone mill and refined for days. Once it is fluid enough, sugar is added, and then the chocolate is tempered and poured into the molds to make the bars you see here. And I must say I can’t wait to do some experimental baking with these bars! You can bet there will be future posts about this chocolate! 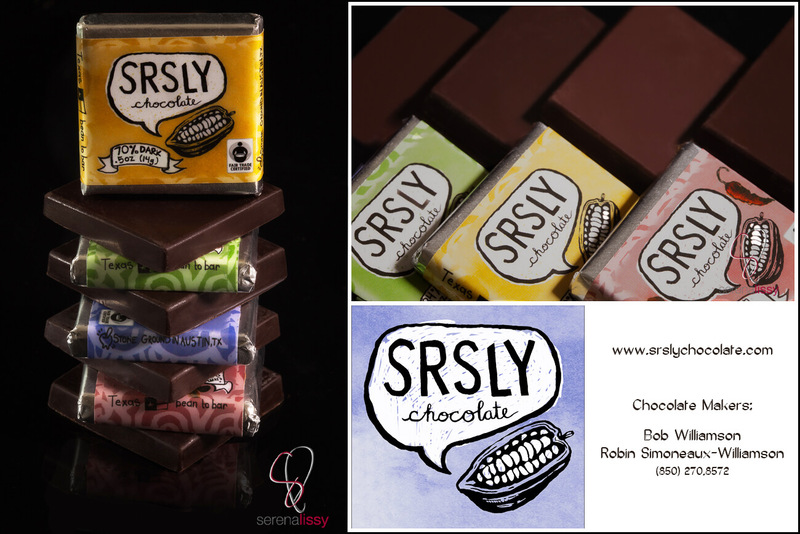 Currently there are two bar sizes and four varieties of Srsly Chocolates. They have an 84% dark, a 70% dark, an Oaxacan espresso, and a sea salt and almond flavor. They can be found at: Wheatsville Co-Op, Whole Foods, Froyoyo, Coterie Market, Live Oak Market, and River City Market. You can also order from their website if you don’t feel like having a bunch of chocolate in your suitcase to carry home. These two take their chocolate seriously but like to have fun at the same time, which is probably one of my favorite reasons for liking them so much. The store is open M-F 10-6 and Saturdays 11-4. 7425 Burnet Road, Austin, TX 78757. His chocolate products can be found all around town. Antonelli’s Cheese Shop, Coterie Market, Austin Wine Merchant, Prima Dora, and Breed and Co.
And there you have it! 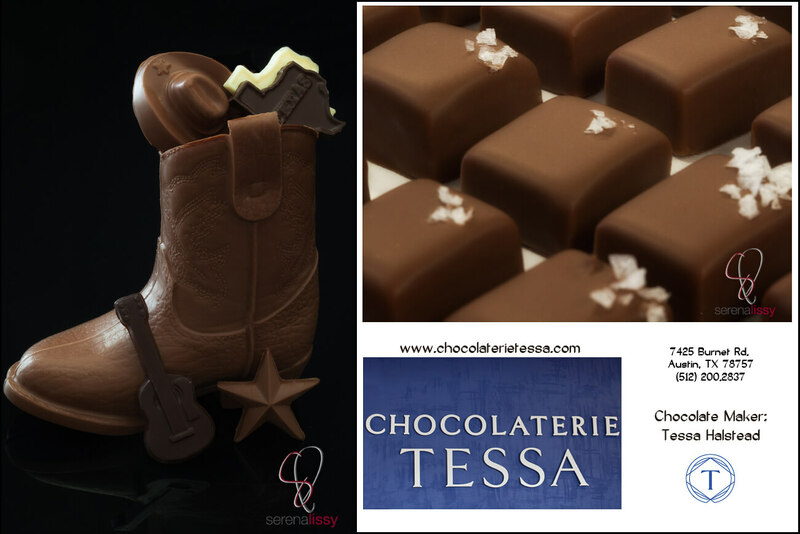 Best of Austin chocolates for 2015. 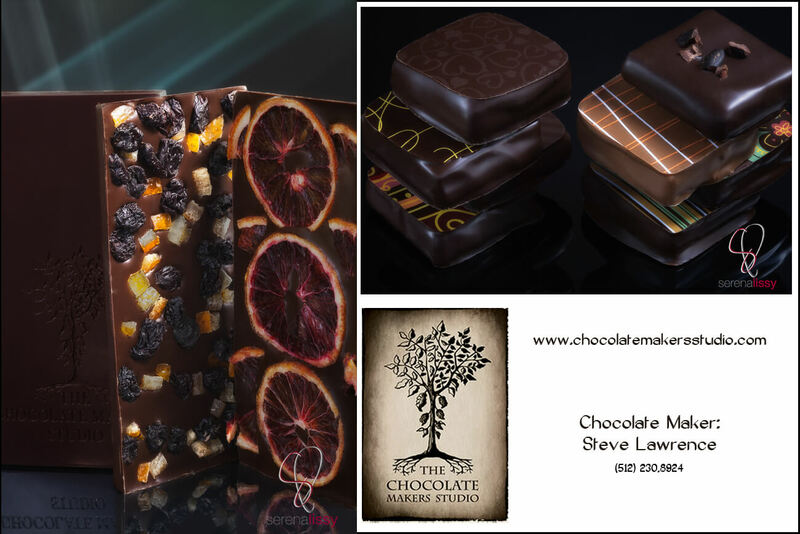 If you have any other chocolate makers that we missed, please leave a message in the comments and we will be sure to get out and taste them as soon as we can. I am OBSESSED with Chocolaterie Tessa. Her stuff is amazing. She has some fantastic stuff. And that edible boot is super cute! She has a special one for SXSW. So if you know of anyone looking for a yummy souvenir of Austin, send them her way. Also check-out Maggie Louise Confections (http://www.maggielouiseconfections.com) in East Austin. Just opened first brick-and-mortar boutique this Feb but last year we made Oprah’s Favorite Things and our products have been featured in People, Instyle and even on the Today Show.